Congratulations, on your upcoming destination wedding! So, you're engaged and you've began putting together all the pieces to make a perfect wedding! Greece has a stunning collection of wedding ceremony and reception settings ranging from beach weddings to sophisticated black-tie events. 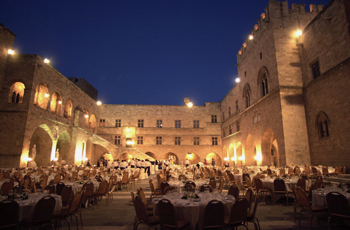 Greece's climate allows for ceremonies in beautiful outdoor locations and receptions under the stars. Imagine vowing your eternal love with a sweet island breeze in your hair with the brilliant hues of the sunset brightening your outdoor event; or say "I do" in a centuries-old Venetian castle or a Venetian style old town, serenaded by local musicians; a traditional village; a unique location on a small islet; historic towns UNESCO listed; in a historic chapel; an ancient Greek temple; by a lake; or on the deck of a sailing boat! Get married in an idyllic location where you can also spend a romantic honeymoon. 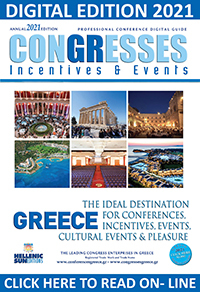 Greece provides the ultimate setting including cosmopolitan locations where you can treat your guests to an exhilarating destination that manages to summon a certain sophistication while enchanting stylish night owls and all-night revelers at the same time. Picture your perfect wedding the way you've always imagined. Experienced planners will keep you on track and smoothly execute your vision so you can be free to spend your time daydreaming of the moment you say "I do". They will help ease the burden of planning a destination wedding and get you through your big day with grace and style. Planning pros from around the country are able to do everything for you -- choose someone to perform the marriage; help choose a location; contact hair and makeup artists, florists, photographers and caterers; and assist you with the formalities of the marriage. They will also help you to stretch a budget without sacrificing style. 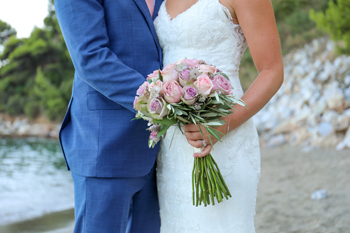 Their "one-stop shopping" approach has one goal in mind – to make the planning and coordination of your Destination Wedding as simple and as stress-free as possible. There are plenty of top-notch hotels catering to beach brides and with ballrooms for those who don't want sand in their shoes. Weddings can be civil, Christian Orthodox, Catholic, Jewish or blessing. Services are available for first-time brides and grooms, those renewing vows, or couples just interested in reaffirming their love for each other.